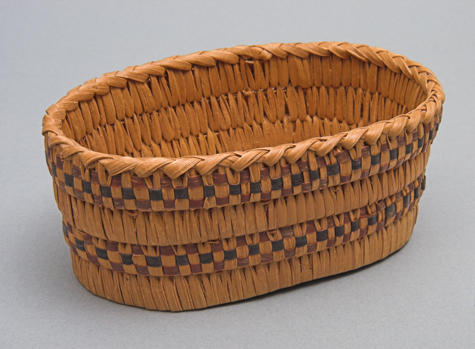 This basket, made by Salish women from the Fraser and Thompson River area of British Columbia, is made of cedar roots sewn together over slats. The chequered design on the side is created with strips of cherry bark. This basketry technique known as beading creates rows of alternately exposed and concealed stitches on the basket wall.